Old Macdonald found this article in today’s Guardian (he buys it for the sports pages really but does read the rest) and wanted to share it with you. It shows how many key species are threatended all around the world and how hard we must all work to protect them. Congratulations to Damian Carrington who wrote this. The blue-tongued forest giraffe, the national symbol of the Democratic Republic of the Congo, is on the brink of extinction, according to the latest update to the red list of threatened species. 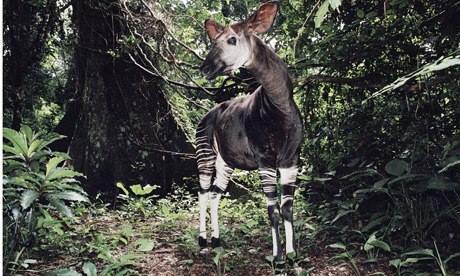 The stripy-legged creature, which appears on Congolese banknotes and is actually a species of okapi, has become another victim of the DRC’s long-running war. But surveys reveal that conservation efforts have had a positive effect on ocean-roaming leatherback turtles and albatrosses, while a Californian fox has returned from the edge. “This red list update shows some fantastic conservation successes, from which we must learn,” said Jane Smart, a director at the International Union for the Conservation of Nature (IUCN), which compiles the list. “However, the overall message remains bleak. With each update, whilst we see some species improving in status, there is a significantly larger number of species appearing in the threatened categories. The world must urgently scale up efforts to avert this devastating trend,” she added. The red list now contains assessments of 71,500 species, including all mammals, birds and amphibians. The latest update added more than 1,000 species. Of the species understood well enough for a judgment to be made, more than a third are under threat. About half of known reptiles have been assessed and a third of fish, but only a fraction of invertebrates, plants and fungi. Habitat destruction, hunting and the introduction of alien predators as a result of human activity are causing the greatest mass extinction of species on Earth since an asteroid strike wiped out the dinosaurs 65m years ago. The shy forest giraffe is confined to the fast-disappearing and militia-filled forests of DRC, and its population is plummeting as its meat is prized. “It is revered in Congo as a national symbol but, sadly, DRC has been caught up in civil conflict and ravaged by poverty for nearly two decades,” said Noëlle Kümpel, co-chair of the IUCN Giraffe and Okapi specialist group. The animal, which has a prehensile blue tongue and zebra-like stripes on its behind, is extremely difficult to protect in an area rife with elephant poachers and illegal mining. In a notorious incident in 2012, armed rebels attacked the headquarters of the DRC’s Okapi Wildlife Reserve and killed seven people and all 14 captive animals. 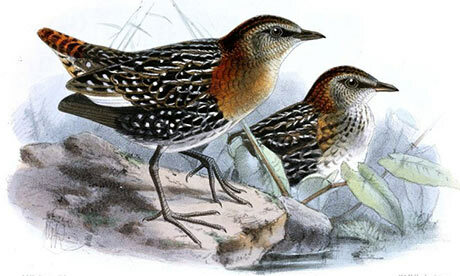 Other species whose prospects are plunging include the white-winged flufftail, shown underneath, a secretive African wetlands bird threatened by agriculture. “People treat wetlands as wasteland that needs to be drained,” said Craig Hilton-Taylor, manager of the IUCN’s red list unit in Cambridge. Assessments have been added for 24 Caribbean skinks – a type of lizard – but it may already be too late. “We went to look for them, but there is no trace,” said Hilton-Taylor. Many may already be extinct, having fallen prey to mongooses that were themselves introduced to tackle an earlier alien predator: rats. Among birds, the martial eagle – a sub-Saharan bird of prey – is struggling as it is shot and poisoned by farmers. Its numbers have plummeted by 60% in 20 years. The decline of many species is linked to human development, but Hilton-Taylor warned that many people depended on wildlife. He highlighted bees and other pollinators believed to be declining globally. The IUCN has added assessments of 83 bumblebees and hundreds more are to follow. “Without pollinators, many food crops would not grow,” he said. A report in 2010 concluded that environmental destruction costs the world’s economy trillions of dollars a year. The recovering species highlighted have all benefited from conservation action. 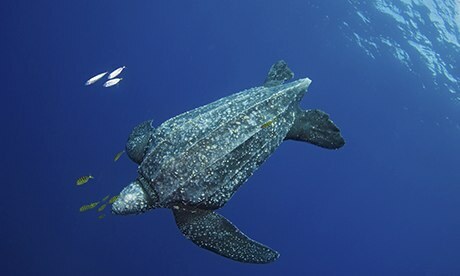 Leatherback turtles, a global species, have been plagued by the ease with which their beach-laid eggs can be poached and by being drowned in industrial fishing nets. Beach protection has led the Atlantic population to double in two years, although the Pacific population remains in severe decline. Another ocean species that roams for thousands of miles, the albatross, has seen some recovery after action against long-line fisheries. The extended lines of multiple baited hooks attracted and ensnared many thousands a year. The black-browed albatross, centred around the Falkland Islands, and the black-footed albatross, concentrated around the Hawaiian chain, have moved down to “near threatened” status. 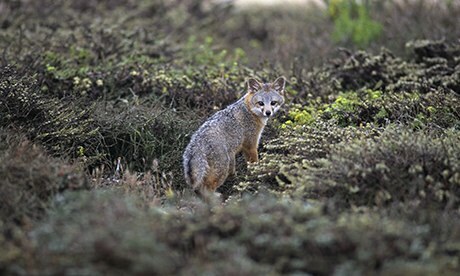 Another success is the island fox, below, which had been lost from some of the southern Californian islands on which it lived, but has staged a remarkable comeback. A captive-breeding and reintroduction programme was accompanied by vaccination against canine diseases, which had decimated numbers. Golden eagles, which prey on the fox, were also relocated as part of the plan.